Arsetta's Inc ReadySetAuction Fundraiser Software (www.readysetauction.com) is web-based benefit auction management software for organizing and conducting live, silent and online auctions. This software has features and tools for donor and donation tracking, can generate printed catalogs, bid sheets, gift certificates and name tags. There is guest management features with bidder number assignment, meal tracking and also table tracking capabilities. This software is designed to be an all-in-one flexible solution to manage any type of online benefit or auction. ReadySetAuction is easy to use. It has built in tools and wizards to walk you through each step. The design and layouts are simple and basic which makes it easy to navigate through the entire system. It has multi-user capabilities and can be accessed from anywhere which allows for end to end auction management. This software allows the auction organizing committee of a nonprofit organization and the community of supporters to collaborate in one application. Committee members can manage the solicitation process, track and manage donations and guests and setup the auction webpage and online catalogs. Donors and guest can make cash donations, submit auction items, purchase tickets, look at online catalogs, and bid online. This is a web based tool which has free web-based technical support during regular business hours. It is recommended when using this software that you use Firefox browser for Windows, Mac and Linux. Camino web browser for Mac users is also supported. For Windows XP, Vista and Mac OS X it is recommended to use Firefox 2.0 and higher. ReadySetAuction is easy to use. It is web-based so it is immediately accessible through Firefox and Camino web browsers. There is no hardware to install or configure. This is a fully hosted application which runs on Arsetta's secure servers so there is no software to install. This auction management software, which is web hosted can be accessed by multiple auction committee members simultaneously and provides up-to-the-minute auction data. This multi-functional management software can manage and track donations and guests, generate catalogs, set up auction sites and allow bidders to browse the catalog and bid online. 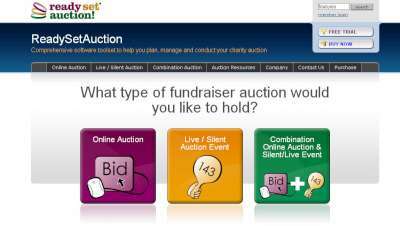 This is all-in-one auction management software which can be used for all aspects of running an online event. Pricing varies according to which package your nonprofit organization selects and what type of event you are planning to have web hosted. The base package starts at $349 and there are additional add-ons that can also be purchased. You can custom select which packages you want and any additional add-ons for your specific needs. Optional add-on modules may boost the initial cost of the purchase price.